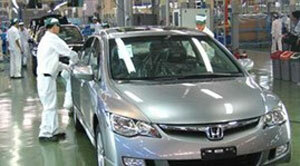 Car sales have shown a positive trend this year with the distribution number for high-end imports on the rise. According to figures released by the General Statistics Office, retail sales in general goods and services throughout Vietnam have recorded a marked increase of 11.9% growth during April 2015 (excluding inflation). Research by Rong Viet Securities points towards a positive outlook generally, but especially in the retail automotive segment, which has been benefiting from remarkable recovery, with 20% growth in 2013 and 40% in 2014. Sunny prospects for the automobile sector in 2015 have been helped by the fact that loans to buy automobiles are now much more appealing, as interest rates are currently low and stable-from 7% to 9% per year for short and medium-term loans. Also, the consumer confidence index for 2014 recorded a 5% increase on 2013. The distributors of imported vehicles are expecting high growth this year in their commercial vehicle sector (trucks, dump trucks and tractors) as a result of the implementation of stricter limits on overloading trucks, the import duty on cars being cut by 50% from 2014, and the economy’s overall upswing in recovery which is likely to prompt an increase in the demand for freight transport. However, despite this positive trend, in 2015 the import of passenger cars is predicted to slow compared to 2014. As the import tariff will remain unchanged (50%) this year, and will drop to zero in 2018 following the ASEAN Trade in Goods Agreement, it does not make financial sense for customers to buy this year. As such, the forecast for this segment remains modest for the years leading up to 2018, when tariffs will be completely removed and the sales of both domestic assembled cars and passenger cars are expected to go through the roof. Due to the tariff differential, domestic assembled cars are typically lower in price than imported products. As such, distributors of locally assembled vehicles are optimistic that their more favourable prices will stand in their favour for now. However, this price differential will be eliminated in 2018 when the import tariffs are removed. The Ministry of Industry and Trade has proposed cutting the special consumption tax on domestic assembled passenger cars that are 2-litre and under in engine size, while raising the tax on premium imported passenger cars with 3 litre engines and upward. However, the amended Law on Special Consumption Tax will not come into effect until after 2015, and so over the next three years, the government is considering a tax cutting process for cars and trucks, specifically. The above analysis shows that the stocks of car retailers and distributors are expected to rise over the course of 2015. In particular, stock investors should keep an eye on the rising fortunes of imported commercial vehicle distributors Dongfeng and Hino, and distributors of domestic assembled passenger cars such as Toyota, Suzuki, and Daihatsu.